but I have not made it available for public reading until now (2018). It is 193 pages, and designed with old Microsoft software and does need many edits. I apologize for any errors; it’s too difficult to revise this publication. Nevertheless, it’s still a good source of images of my art from my Mexican painting years (2007-2011), and accompanying the images is my written description of what the art meant to me in doing them and some discussion of the unique technique employed: many are done with chapapote (tar) and why I chose this medium when I painted in Mexico. 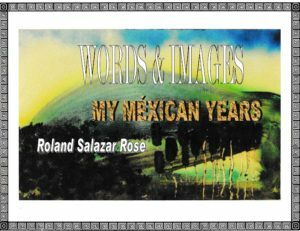 As I wrote in my e-art book pagehttp://www.salazargallery.com/e-books-revised/ : today artists need to utilize many different new Internet tools to inform on their art; what there art is about and what it means to the artist and what it can mean to the viewer. No longer, can one stand with the statement: “I did the art. and you can make out whatever you want of it.” Such a statement limits the audience for an artist, and is an ‘art for art’s sake’ sort of position taken by an artist who does so. http://www.salazargallery.com/end-user-and-license-agreement/ PLEASE read the agreement for download/or use of the copyright of this e-pub “My Mexican Years”.